Weorod - Reenactment - Living History - Join the Adventure! 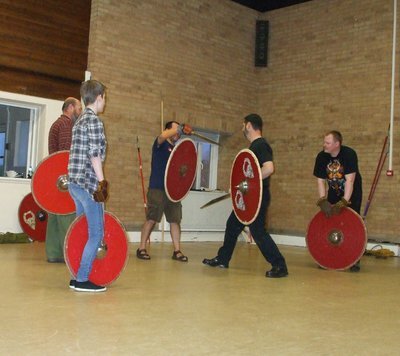 As a small independent group Weorod is always seeking new members to come and "join the adventure"
With regular training sessions in Southern Hampshire you will have the opportunity to learn many of the skills and crafts of the period from living history to combat re-enactment. What can I expect if I decide to come along? All members of Weorod's warband are expected to have undertaken full combat training prior to being allowed to participate in combat displays and weapons demonstrations at shows. We will provide individuals with the necessary training to become competent and, probably more importantly, safe with the spear and shield. These would have made up the basic weapon set of the period. Once you have shown that you have mastered these weapons you will have the opportunity to move on to others including the axe and sword. In addition the use of the bow and other missile weapons such as the javelin and francisca (throwing axe) will be encouraged. We will ensure that you are in a safe training environment at all times and initially we can provide you with suitable basic weapons with which to practice prior to investing in your own; we realize that you will wish to come along to a few training sessions before making the decision to commit your time and invest your 'hard-earned cash'. 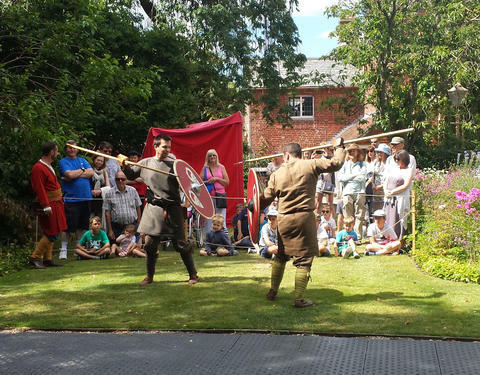 Combat displays can be one of the most inspiring parts of a show and it is often this that brings the audience to our encampment where we can show them so much more! But what if I am of a less warlike disposition? There are many other opportunities available to those of us who are of a more peaceable nature. 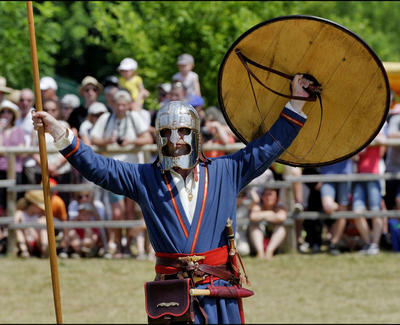 The main purpose of Weorod is to enlighten and educate the public about our chosen period of history and whilst our combat displays may draw the crowds it is the Living History encampment that provides us with this opportunity. 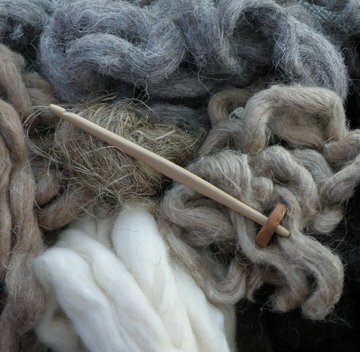 Preparing wool and flax fibres would have been one of the most important tasks in the Anglo-Saxon day - from combing wool and scutching flax, through to spinning with a drop spindle. Would you enjoy learning and demonstrating these procedures for - or even with - a spellbound audience? A quick look to the more forgiving soils of the continent will show you some amazing examples of period furniture that survive in the archaeological record. 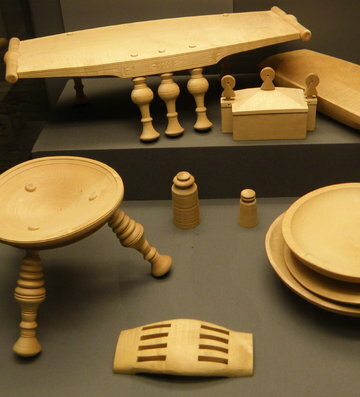 A wide variety of woodworking skills will be required to replicate any of these masterpieces - could this be the challenge that you have been looking for? 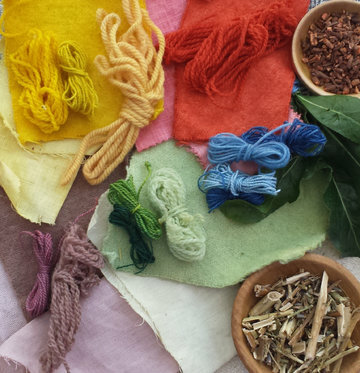 Dyeing with natural dyes can be an unpredictable, yet very exciting process. Researching available resources and looking at evidence from chemical analysis you could re-create some of the many shades of the time. Would you like to share your adventures in colour with a fascinated audience? These were highly valued skills in the time of our ancestors. 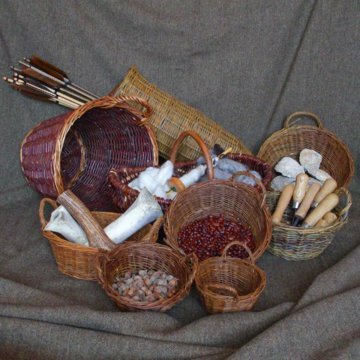 From baskets for storage, fishing and straining, through to rush matting for floor and table coverings; all of these commodities would have been invaluable within the Anglo-Saxon household. Even today there is a wealth of material to help you on your way to learning a fascinating and creative skill. 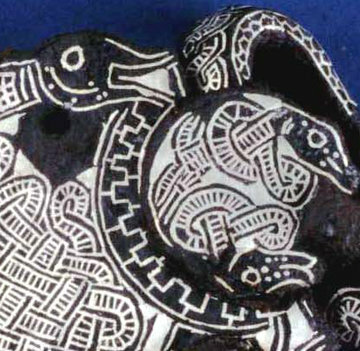 Tauschierung work is the ancient art of inlaying iron with precious metals. Discover the many surviving examples and the intricate designs of the period, learn the techniques of the craft and inspire the awe and wonder of all who witness your work! Would you enjoy investigating the many period examples of cosmetic equipment and exploring all of the possibilities that they suggest? 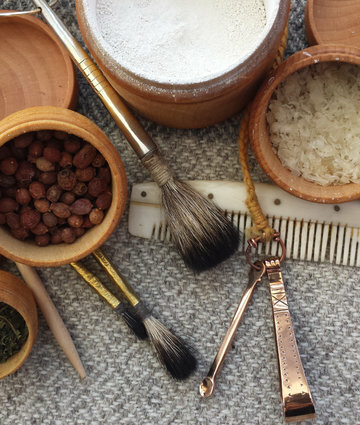 Could you explode the myths of poor hygiene amongst our ancestors with reference to the wide variety of personal care tools that they left behind? With this display you could really bring the people of our history to life! As the Games Master you would be skilled in many of the period board games that are represented in our culture. 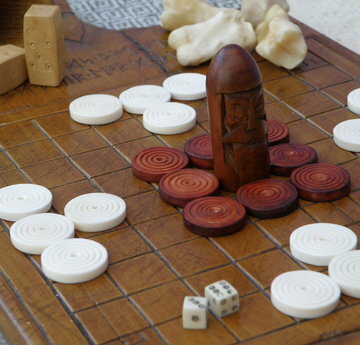 A variety of talents will be needed to manufacture the playing pieces and gaming boards of the time and, of course, a playful nature throughout events! The true master could also inject some extra drama with some heroic tales or poems of the time? These are just a few of the crafts and skills that you could contribute to the Weorod experience, there are many more - it is up to you. What inspires you? Weorod represents a cross section of society from within our chosen time period. From the humble freeman to the landed nobility; then as now there would have been a varied community; male and female; people from all walks of life. So whether you are a warrior or a weaver, please get in touch. Minimum age for membership of Weorod is 18. Due to the manner in which we have chosen to present our living history displays, through continuous, active demonstration, we are not willing to accept membership applications from those under the age of 18. It is unfair to inflict the restraints of &apos;anachronism free living&apos; on the small and adventurous and we do not believe that such an environment is stimulating, safe or indeed enjoyable for them. The second requirement is the ability to transport yourself and your kit to and from Group Training Sessions and Events. We have no &apos;Group Transport&apos; and most‎ of our shows are not easily accessible by bus or train. All members are expected to be responsible for transporting themselves, and as such, your own vehicle is really a necessity. The third and most important requirement for membership is the desire to contribute. As with many things in life you will only get out what you are prepared to put in and with Weorod there are no &apos;free rides&apos;. If you are prepared to commit the time and resources, willing to develop and grow then maybe we are the right group for you. We truly welcome enquiries from anyone with a sincere wish to contribute to our community. Still interested in finding out more? Please e-mail us via the 'Contact Us' page.